When running this script, I get a result of "Frost Hidden Appearance 0/1" while some others in Discord say it returns 1/1. We need to figure out what exactly this is tracking. For Unholy it was 2000/2000 summoned minions, for Blood it was apparently 1000/1000 mobs hit with 吞噬. On Overachiever you can find this as a prerequisite for 纪念过往. I have the Blood Hidden Appearance already, and both the Blood and Unholy prerequisites completed, still farming Apocalypse casts for the Unholy appearance. Edit: It turned out that this flag was completed by going to the Lordaeron Throne Room and doing /kneel. While you must be in Frost Spec to get the flag completion, its does NOT require any specific AK level, as people have confirmed getting flag completion on a level 100 with 0 Artifact Knowledge. Besides the flag completion for the hidden tracker it does not appear to be related to anything in game and was probably a leftover remnant of an unimplemented Artifact quest line. 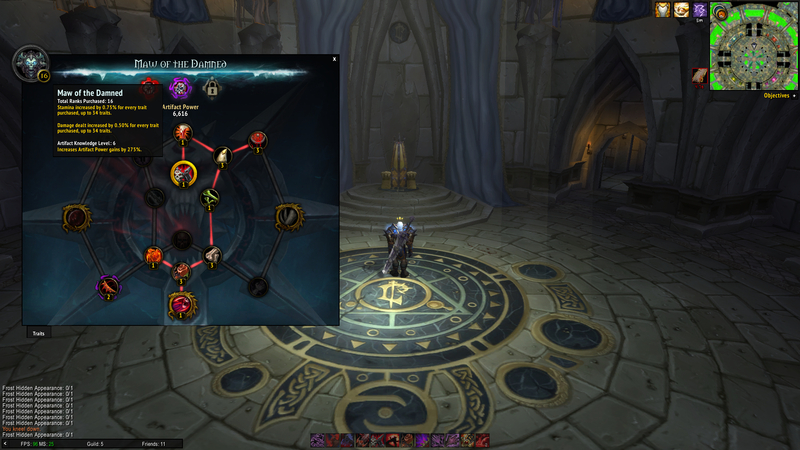 Completed by using /kneel in lordaeron throne room. Edit: Yes, frost spec is required(may even need the swords as well, not certain). As for now this achievement doesn't do anything or lead to anything else, as far as anyone knows. EDIT: After switching to Frost spec, the achievement completed. Order Hall Questline: Not completed. Death Knight Campaign: Not completed. I tried walking into the room, then kneeling, and did not receive credit either. Tried this as Unholy at AK 7. Flew into room, dismounted, /kneel. Didn't complete. Exited the room, switched to frost, reentered and /kneel and it completed. Maybe you have to be in frost spec? Or maybe you have to walk in from the entrance instead of flying? Or should that be "oh ^&*!e we did forget to put that one in!" Just /kneel in Lordaeron's Room. -This is located in Undercity. Summon 2000 undeads (via Apocalypse, Army of Dead, etc) -Best way to fast track this is entering Proving Grounds, start a challenge, summon your Army of Dead, yield/fail the trial, the 10 minute CD resets. Rinse and repeat. The /run codes will tell you your progress on all three when copied and pasted individually.